The exceptional Pine Cliffs Resort occupies a truly enviable location, extending some 72 acres across the cliff tops above the soft white sands of Falésia Beach. The exceptional Pine Cliffs resort occupies a truly enviable location, extending some 72 acres across the cliff tops above the soft white sands of Falésia Beach. 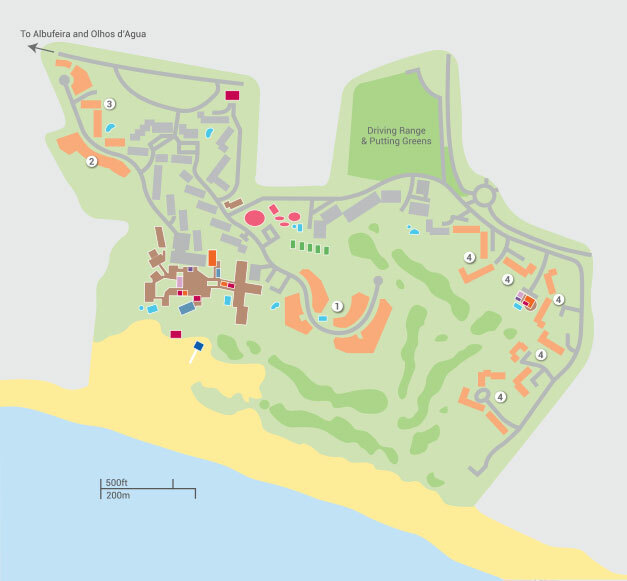 A fabulous array of sports and leisure facilities have been thoughtfully designed and positioned to make the most of the outstanding sea views and embrace the naturally beautiful landscape. Fully deserving of its five star reputation, Pine Cliffs provides first class service and outstanding accommodation, with activities to suit guests of all ages. For those looking for action, there’s a stunning golf course, tennis academy, watersports and well-loved kids' clubs, while superb restaurants, bars and an exquisite spa are on hand for some delightful holiday indulgence. Outside the resort the traditional Portuguese towns of Açoteias and Olhos d’Agua offer further dining options, while bustling Albufeira is also within easy reach. There are few courses around the world to rival the location of Pine Cliffs’ immaculate 9-hole course, built in a pine wood at the edge of spectacular cliffs and overlooking the beautiful beaches of the Algarve and the Atlantic beyond. The architect's main concern was to keep the natural surroundings as it was before the course was built. The unforgettable par 3 9th hole, the Devil’s Parlour, is legendary in golfing circles. And the plunging 200 feet gorge that stands between tee and green, tests the concentration of even the most cool-headed players! The Pine Cliffs Golf Academy features the very best in golfing facilities, meeting the requirements of amateur as well as professional players.It is equipped with the latest teaching technology and a team of professionals with more than 20 years’ experience. The academy has a practice area which is especially designed for helping beginners to the sport as well as improving the techniques of the most experienced players. To perfect your stance, grip and swing, you can also undergo swing analysis and learn from recorded video images of your performance. The practice area includes a driving range with 9 different flag positions which can be approached from various directions and distances: between 50 and 200m, offering perfect conditions to practice short play and putting. There is a chipping and pitching area as well as a large putting green area. In the golf shop you can add to your golf equipment, and hire everything you need for a perfect round. The magnificent terrace of the Golf Club House is the perfect place for a drink or a snack after the game. All golfers can also make use of the various golf courses in Vilamoura as Pine Cliffs Resort now offers a complimentary transfer. Tuition Superbly equipped with the latest technology in teaching systems the Golf Academy is manned by a team of Internationally Qualified PGA Professionals, offering a tuition service second to none for all parts of the game. With a dedicated short game practice area specifically designed to aid the beginner, improvers or experienced golfers and an indoor video swing analysis room, equipped with the V1 swing analysis software which is ideal and to analyse your faults and get you back on the right track quickly and permanently. Dress code At Pine Cliffs Golf Course guests are not allowed to wear jeans or swimming shorts, golf shoes with soft spikes are compulsory as well as collared shirts. Open all year, 7 days a week, from 8am - 6pm (subject to change depending on the season). Pine Cliffs has five recently renovated tennis courts, including two clay courts, all of which are floodlit for those preferring the cooler evenings. If you feel you need some help with your strokes, qualified professionals offer coaching for guests of all ages and ability. In the golf shop you can book a court, individual or group lessons and even find a match partner. Courts open till later in the summer months. So hire a racquet and enjoy a set or two with friends or family. Pine Cliffs Resort boasts two Health Club centres for your relaxation and enjoyment, one located in the main hotel building and the other at Pine Cliffs Residence; Casa Pine Cliffs. They both offer a full gym, sauna, and personal instruction, whilst the gym at the hotel also offers an indoor pool and jacuzzi, and the Casa Cliffs gym also benefits from a steam bath. There are many classes on offer including Ab-solution, Stretching, Kids Fitness, Fitball, Gap, Kids Pool and Aquafamily, whilst the use of the sauna, jacuzzi, gym and indoor swimming pool are free of charge to use. The children's playground is great for the little ones, whilst there is a games room which will keep teenagers amused! Alternatively, why not hire bikes and cycle around the resort, exploring the fantastic grounds! Pine Cliffs exceeds expectations with its array of watersports, Health & Fitness Club, 9-hole Pine Cliffs Golf & Country Club and Annabel Croft Tennis Academy with five floodlit tennis courts and a padel court. The two kids clubs at Pine Cliffs offer superb facilities and entertainment for children from six months through to 12yr olds. For the younger children Porto Pirata is set in wonderful grounds with its own pirate ship, swimming pool, and another pool for remote control boats, a bouncy castle, a recreational terrace, an 18-hole mini golf course, a bike track and a basketball and volleyball court. Porto Pirata’s well-trained caring staff offer a daily entertainment programme to ensure unforgettable holidays for your children, packed with moments of joy and fun. Children and adults can also make use of the games rooms, with a variety of videos and games and a table tennis room. The Junior Club features a fun programme of sport, there is much to do from Badminton, Football, Volleyball, Basketball, Field Hockey, Archery, Beach Walks, Water Aerobics, Step Aerobics, Fitness Exercises, Tai Chi, Bike Trips and much more so parents can make the most of some welcome free time. The children's village is open for clients use all year round (however there is no supervision and no organized activities) but adults may use the playground area to play and have fun with their children, additionally the mini golf, tennis and golf facilities are also available year round. Open from April - October, 7 days a week. Times of activities vary, usually running in 30 minutes to 1 hour 30 minute time slots between 11:00-19:30, times are subject to change. For the Juniors Club, vouchers can be purchased on resort, activities usually vary between 1-2 vouchers, the cost is approximately €7 per voucher. Open from April - October, 7 days a week, between 9:30am - 5pm. Porto Pirata is a special place for younger children, aged between six months and 8 years. Developed over an enclosed area of 7000 square metres, this children’s activity centre contains two wooden boats, a swimming pool and another pool for remote control boats, a recreational terrace, an 18-hole mini golf course, a bouncy castle, a bike track and a basketball and volleyball court. Porto Pirata’s trained assistants offer a daily entertainment programme to ensure unforgettable holidays for your children, packed with moments of joy and fun. Children and adults can also make use of the games rooms, with a variety of videos and games and a table tennis room. For children aged 6-36 months the price is approximately €120 for a full day, €90 for a half day with lunch and €60 without lunch from June-August. Outside this period prices are around €90 for a full day, €60 for a half day with lunch and €40 without lunch. For children aged between 3-4 years the price is approximately €70 for a full day, €60 for a half day with lunch and €40 without lunch from June-August. Outside this period prices are around €50 for a full day, €40 for a half day including lunch and €25 excluding lunch. For children aged between 5-8 years the price is approximately €50 for a full day, €40 for a half day with lunch and €25 without lunch from June-August. Outside this period prices are around €30 for a full day, €25 for a half day including lunch and €20 excluding lunch. Open all year round, 7 days a week, 9:30am - 7pm. Serenity The Art of Well Being, Wellness & Beauty Center is located in the pine cliffs ocean suite building and offers the most advanced therapies and beauty treatments for men and women, designed to relax the body and soothe the soul. Why not leave the children in the expert hands of the kids’ club team and enjoy some well-deserved pampering? The minimum age requirement for access to the Thermal area is 18. Please let the staff know at the time of the booking if you are under 18. There are no less than five wonderful pools to choose from at Pine Cliffs, including a heated indoor pool at the hotel’s health club and one specially for children. It’s the ideal place to meet up with new friends and enjoy hours of contented water play. There is no age requirement to use the pools however children must be accompanied by an adult. Open all year, 7 days a week, between 9am - 7pm. With eight superb restaurants, three bars, a café, beach bar and snack bar to choose from, Pine Cliffs has your every culinary wish covered. Each one has its own individual style, many with outside terraces where you can dine under the stars. With cuisines from around the world ready to seduce your taste buds, choosing a favourite will be quite a challenge! With its elegant, yet relaxed atmosphere, O Pescador offers a wide range of seafood specialties and meat dishes. Serving lunch and dinner, lunch prices start from approximately €16 for a main course and around €19 for a dinner main course. With its mix of regional and international cuisine, the restaurant Jardim Colonial caters for all. Jardim Colonial is the main hotel restaurant with the option of al fresco dining in its courtyard area filled with character. Yakuza by Olivier is one of the finest Japanese restaurants in the Algarve. A menu of traditional Japanese specialties with a touch of Mediterranean flavours, served in an outdoor garden setting. With a new concept and relaxed atmosphere, the Piri Piri Steak House offers a unique selection of prime meat produce, grilled to perfection. Prices range from approximately €18-€34 for a main course. With its unique and relaxed atmosphere, granting you an enchanting mediterranean experience. This new addition to the Pine Cliffs Resort is located at the luxury Pine Cliffs Residence. Overlooking the golf course and set by the swimming pool. Serving a range of choices, from pastas and risottos to fish and meat dishes, prices are approximately between €12-€28 for a main course. The mini-market is open during high season only, from 8:30am - 6:30pm. There is a variety of shops on the resort, including a golf shop, gift shop, florist, boutique "Zina", international newsagent and a mini-market. Please note that these will not be open all year and may be limited outside of June - September. Praia da Falésia is one of the Algarve’s loveliest beaches, the only one to be awarded the European Union’s ‘Golden Flag’. Its soft white sand and crystal clear waters contrast beautifully with the golden tones of the towering cliffs behind. A glass elevator carries guests down the cliff face to the private beach where sunloungers, towels, parasols and a variety of watersports are at your disposal. The attractive beach club here is famed for its fresh seafood and mouthwatering salads. Available during high season, between 9am - 11pm. There is an on resort shuttle bus/ train, a convenient way to easily make your way around. Free Wi-Fi is available at the Pine Cliffs Residence reception. A luggage storage room is available at the reception, so that you don't have to worry whilst enjoying the facilities on your last day. You will also have access to shower facilities. The villa itself was lovely, spacious and well configured. However as reported already, the pool was unusably cold. I mean totally freezing and we were all so disappointed that when we asked, apparently it couldn't be heated. This is extraordinary in such a large high quality villa. The Pine Cliffs resort is good, and reception did come and fix the fridge which wasn't working, and the TV, but despite repeated requests they never did fix the phone. To book the spa I had to use my mobile phone! We were also disappointed that the Yakuza restaurant was closed, as was the beach restaurant Mare, which meant there were no facilities at all on the beach, including toilets which when the beach is so far from the hotel was an issue. All in all the Villa itself was good, but the lack of a heated pool spoiled the entire experience. The villa was fantastic and lived up to all expectations. The Pine Cliffs Ocean Suites are perfect for a luxury family holiday. The resort is beautiful and has everything you could want. The suite itself was actually an interconnecting room which didn’t bother us. We had a fully functioning kitchen which was perfect for us. The suite was exactly as described and pictured. It was fresh, spotlessly clean, furnished beautifully and exactly as we had hoped for. We had one problem with the suite during the holiday when noisy building work started directly opposite our balcony. We called the James Villa rep and she came immediately and agreed that it was unacceptable. She dealt with Pine Cliffs and got our room changed which was great. The location of Pine Cliffs is absolutely stunning. The beach is beautiful and the views are amazing. There is a glass lift down to a board walk to get to the beach which is spectacular. We visited a few of the onsite restaurants and the champagne bar which sits at the top of the Cliffs. The food was excellent and we felt that they were fairly priced for what they offered. There is a very large kids play area which has a bouncy castle, swings, slides, climbing frames and bikes and scooters and the best thing is that this area is shaded by the large pine trees. The kids club is excellent here. It is not cheap, but it really is fab. Our little one went a few times and loved it. We also used the babysitting service once. One of the kids club staff came to our suite to babysit. We were comfortable with that as our little one had seen her a few times at the kids club and she was really good with him. The babysitting cost €15 per hour which we felt was reasonable. Our one complaint about Pine Cliffs was that only 1 of the outdoor pools is heated (the one beside the golf clubhouse). The rest are freezing! We used the indoor pool mostly for this reason. It was great and massively underused meaning that we always had it to ourselves. There’s not much more I can say other than this is an amazing resort for families and if you’re thinking of booking it...do it!! Villa was excellent, high standard of living accommodation and everything that could be possibly be needed is provided. Pool gets low score as it wasn't very warm, so did not encourage a great deal of time to be spent in the water. Fabulous villa, clean, comfortable and fully equipped. The gardens were maintained to a very high standard and the views spectacular. Superb range of restaurant and the food was excellent in each one. Highly recommend the Piri Piri Steak House. Would highly recommend this resort and will definitely be going back. Stunning resort with lots for my 3 year old to do. Apartment was bigger than expected, clean and well furnished. The outside terrace was nice but my only criticism is it was shaded all day! Overall Pine Cliffs was great and I would definitely return. Staff were all helpful and friendly as well.